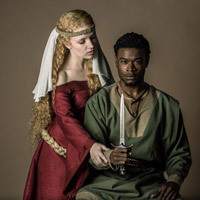 The Conservatory of Theatre Arts in Webster University's Leigh Gerdine College of Fine Arts presents Shakespeare's "Macbeth" Nov. 16-20 on the Browning Mainstage Theatre of the Loretto-Hilton Center on Webster's home campus in Webster Groves. After his glorious victory in a civil war, Scottish general Macbeth encounters three ominous witches. They prophesize his magnificent rise to power, but it is not through noble means. His path involves murder, deceit, and ruthless pursuit of power. All the while his wife, Lady Macbeth, pushes for more, and the body count rises. The infamous Scottish play is one of magical fantasy and tragedy that is considered by many to be Shakespeare’s darkest work. It begs the question: Is there a limit to human ambition? The Conservatory of Theatre Arts at Webster University is a professional training program for acting, musical theatre, directing, theatre studies and dramaturgy, design, technical theatre and stage management. Located in St. Louis, the Conservatory has been training theatre students for the professional world for over half a century. Students are selected through auditions and theatre festivals nationwide, as well as through auditions held on campus. All candidates for admission must complete the audition/portfolio review process to be considered.